Looking for a great new stereo for your ride? Picking the right can be a pain – especially with so many to pick from and the many features available. Rather than give you some long, lengthy list of many models I’ve briefly reviewed 3 of the best touchscreen radios for your money. These are truly excellent choices that most people can afford and will take your music enjoyment to the next level. I’m not joking when I say they’re great! Read on and I’ll also share with you some important things to know before buying a touchscreen double DIN radio. I’d love to help you avoid disappointment and also prepare you for the extra details that come with buying & installing a larger touchscreen radio. Short on time? You can click here to skip right to the product recommendations and reviews. Before you run out and get a touchscreen radio, I’d strongly you advise you to read more. Double DIN stereos often have more details to consider than standard single-DIN stereos do. Be prepared before begin and I want to you be aware of some of the obstacles you might not know about. You’ll have a much better chance of avoiding problems and making mistakes if you’re well educated. Think it’s going to be easy to buy and install a double DIN stereo? NEVER assume that! If you’re lucky, all you’ll need is a custom kit or the original stereo’s brackets. In more difficult installations, however, you’ll have to fabricate your own brackets like you see here. 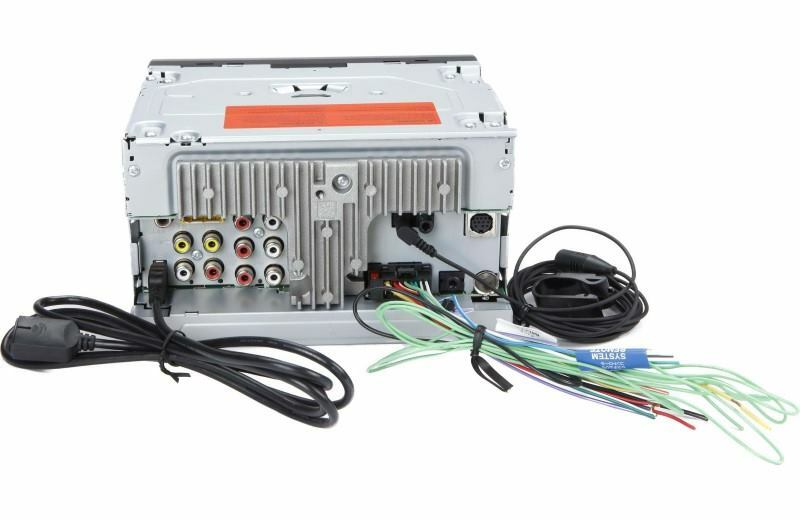 Double DIN stereos are a standardized (more or less) size of car radio which are sometimes more difficult to install. Especially those with extra features like an optional backup camera, GPS antenna, and so on. 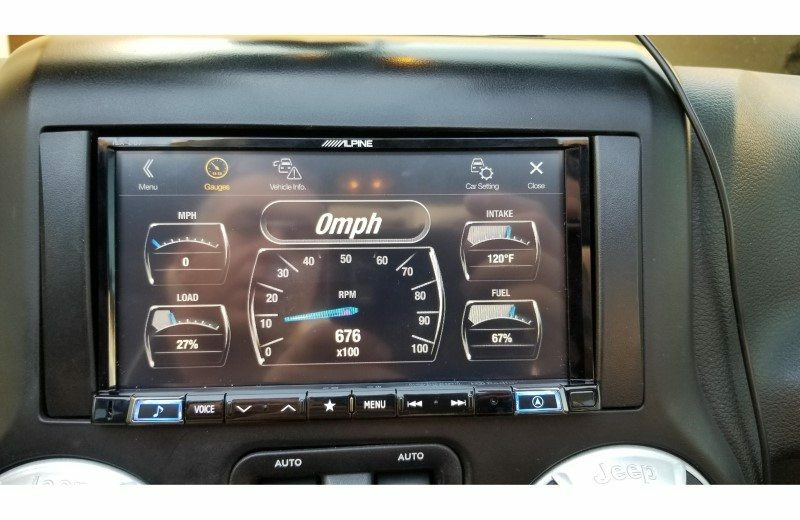 If you’re a do-it-yourself (DIY) kind of person, it’s possible you can do it alone, but it’s important to anticipate the difficulties involved in installing a double-DIN (also called “2DIN”) sized touchscreen stereo in a vehicle. 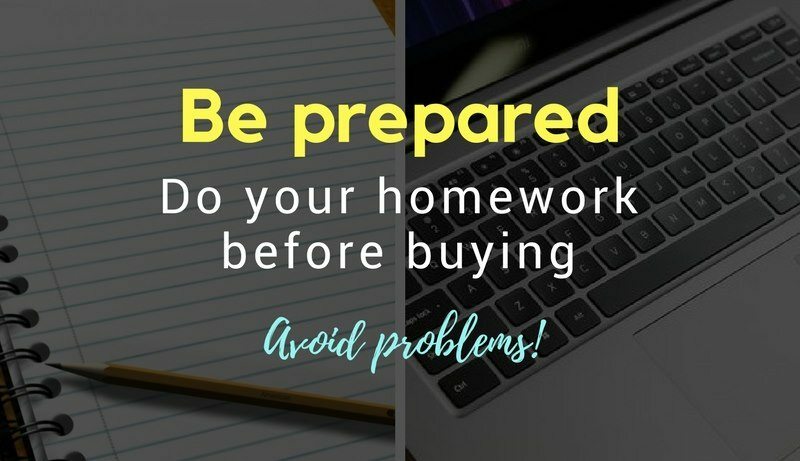 It’s incredibly important to do as much research as possible beforehand – be prepared! You’ll need to find out if a kit is available for your vehicle to make it a simple job. You can find some excellent ones that I use here. 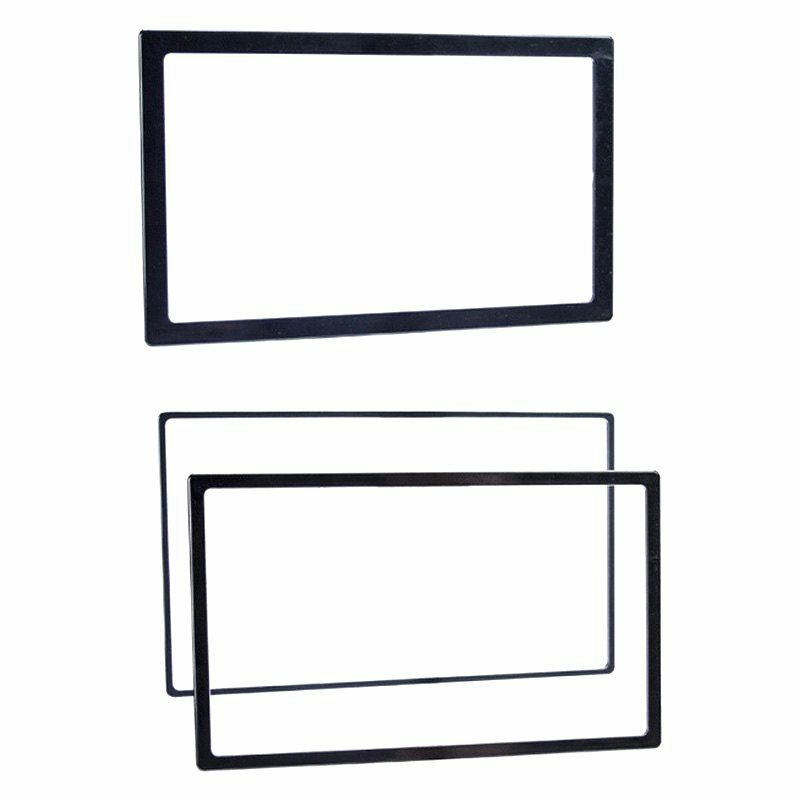 With these installation straps and some metric or machine screws, it’s possible to bend them in to custom brackets and overcome some of the hardest installation obstacles for a touchscreen radio. Sometimes, unfortunately, installing an aftermarket touchscreen stereo leaves a visible gap around the stereo itself. It looks bad and it’s frustrating to end up with that in my opinion. Double DIN trim rings can be very helpful for covering or filling in gaps left after removing a factory stereo and installing a new stereo. They’re normally around $10 or so, depending upon where you find them. Here's a great example of some readily available. In that case you can also purchase custom installation trim rings to help. Whether with a hot glue gun or some other type of adhesive fastener, it’s possible to cut them and attach them, covering the gap nicely. Installing a new stereo using original factory-installed brackets. 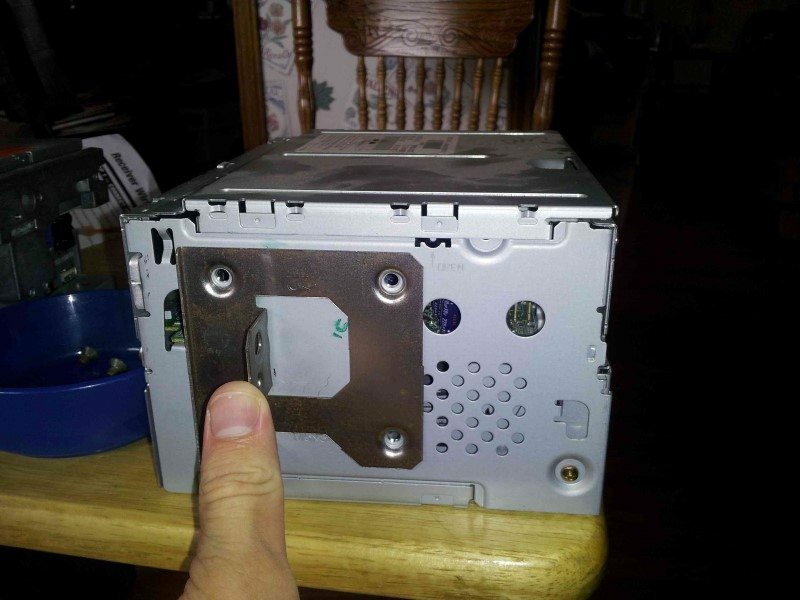 Note: often not all of the screw holes will line up on your new stereo or the depth (for the front of the radio to the vehicle’s trim) isn’t correct. Never just assume you’ll be able to use them. 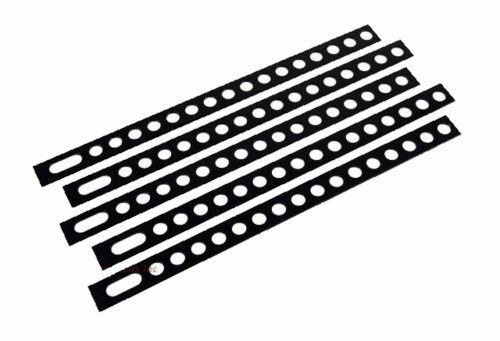 Some may require using only a few of the screw holes or brackets may need modification. 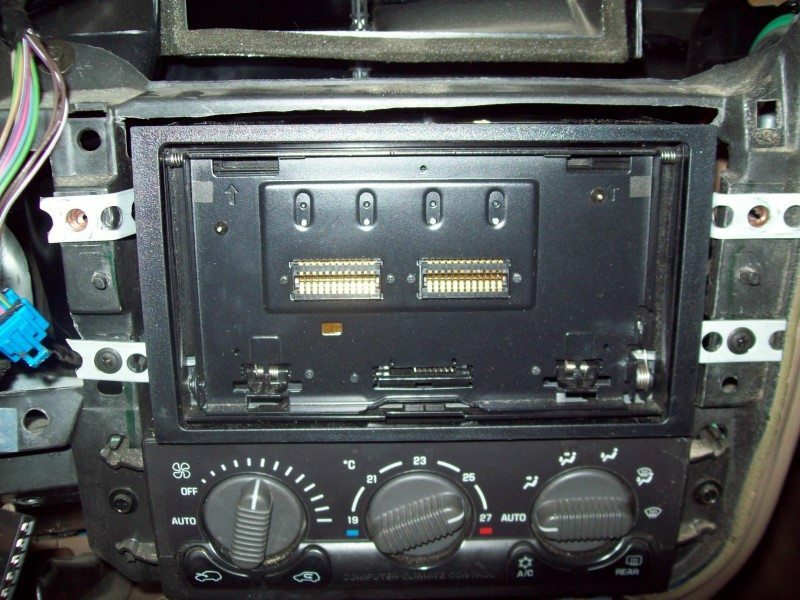 Some imported vehicles (especially Japanese) have factory metal brackets that can be removed from the original stereo. It’s possible, in some cases, to attach them to the new stereo. However, it’s rare that they align perfectly during installation. For that reason it’s still a good idea to check for the availability of an aftermarket installation kit. While the cost is often a bit high, the amount of stress and time you’ll save justifies it in many cases. 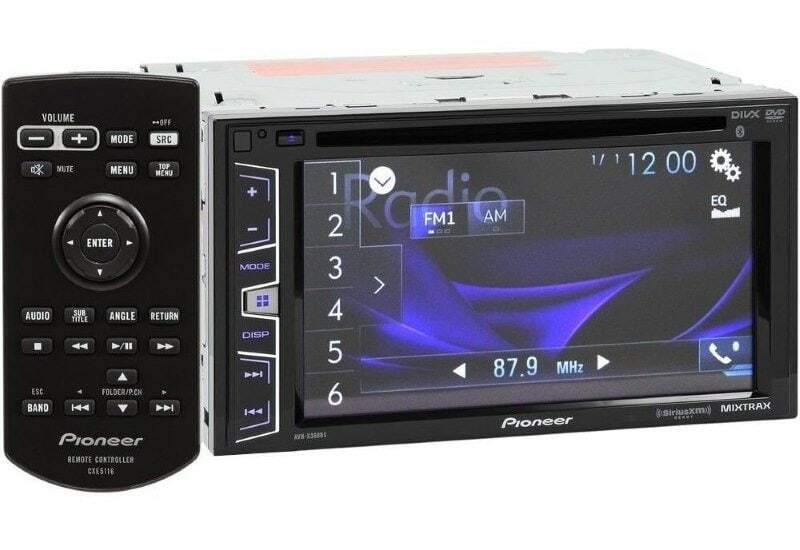 Top: a Pioneer add-on installation kit available for some models of their touchscreen radios. Included is mounting sleeve in case you have a sufficient opening to mount it. 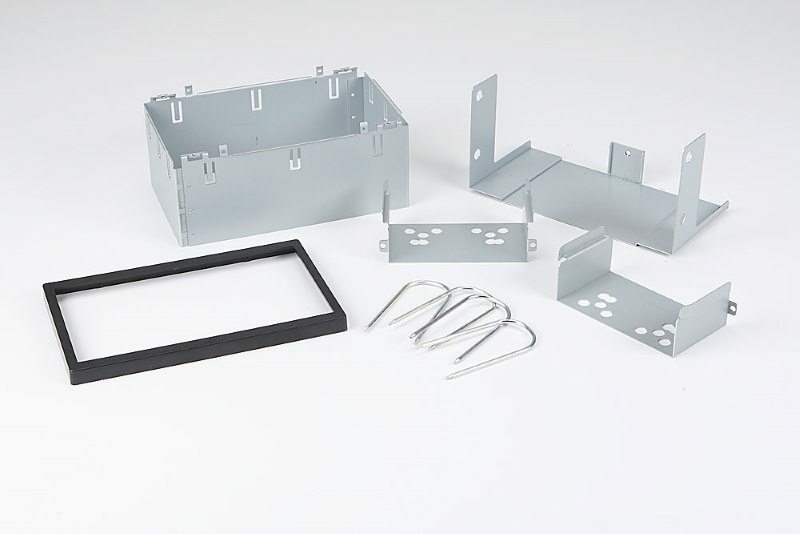 Bottom: an aftermarket installation kit designed to fit a factory opening well. If luck is on your side you’ll be able to use an aftermarket installation kit to do the job. Most 2 DIN touchscreen radios don’t provide or aren’t designed to use installation sleeves but some Pioneer models do. In some cases those are sold separately but if you can use them they’re an easier way to accomplish the job. If you don’t feel prepared for having to do a lot of work to install a large touchscreen stereo, I highly recommend using a professional installer. Trust me when I say, speaking from considerable experience, that it can be a very tough job sometimes. Unless you’re fairly confident you’ve read enough to know it’s not so bad, considering paying a reputable shop to do it for you. 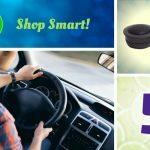 This is especially true if your vehicle has a factory installed premium sound system as those can be difficult to integrate with an aftermarket stereo. 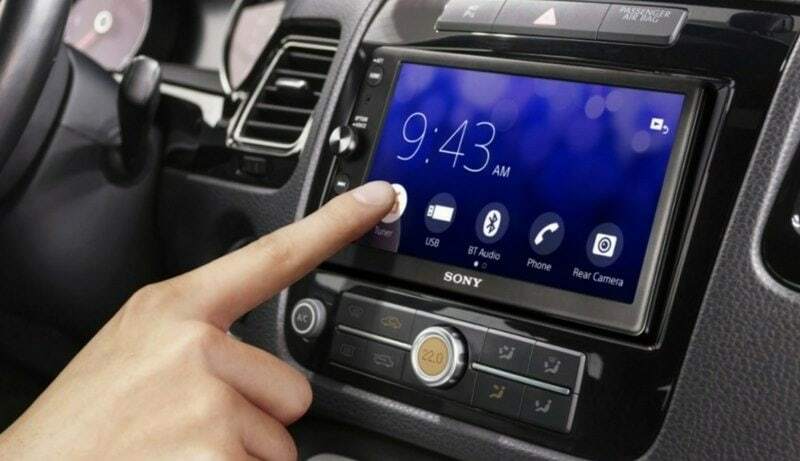 The display panels used by touchscreen radios today are more and more using capacitive technology, although some are a number still use resistive touchscreens. Resistive touchscreens are the original touch-sensing technology in which a 2nd layer of material transparent plastic is placed over the LCD display. When touched, a resistance reading is measured and the radio detects the position of your fingers. The drawback is that they’re not as responsive as capacitive designs, and sometimes they’re slightly less clear too (due to have a 2nd material covering the display). They’re less expensive, however. Capacitive touchscreeens are the type used by cell phones and tablets today. They work by sensing a changing amount of capacitance which is detected by integrated circuits and interpreted as a location on the screen. 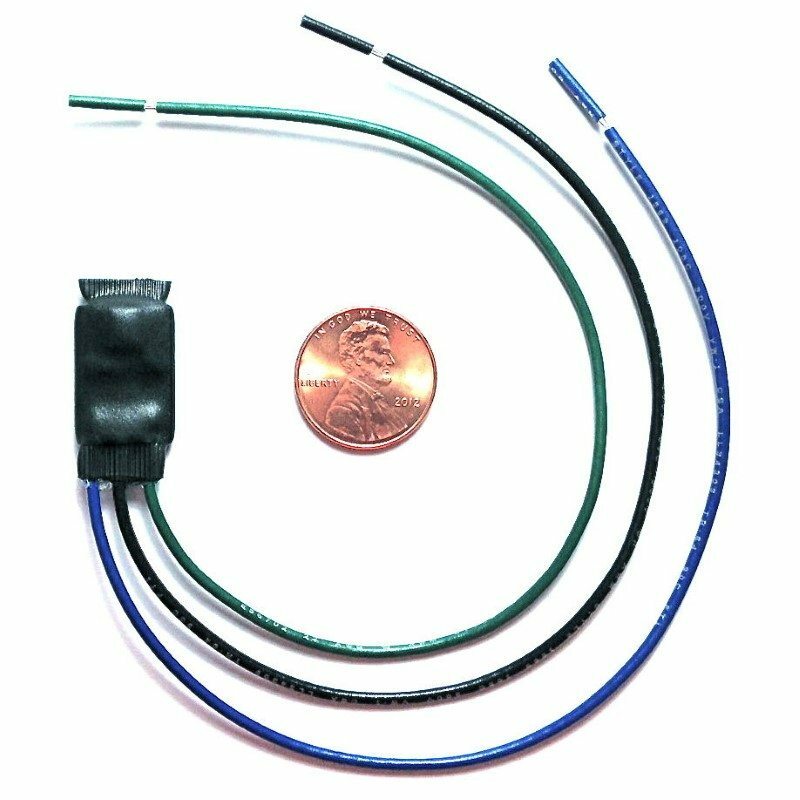 You can expect to find these in the better quality radios as they’re generally more expensive than resistive types. They’re also more responsive than their cheaper counterparts. Another benefit is that displays using them are more clear – even beautiful and crisp! Some models allow integration with your phone in such a way that you can get some of the same functionality your phone provides on the stereo. Using voice commands, receiving and making calls, text message notifications, and audio app controls are a few examples. 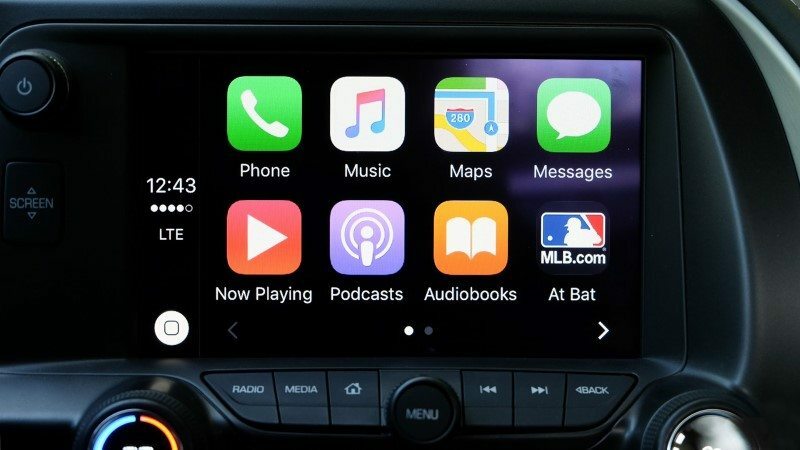 Models that support Apple CarPlay will allow iPhone 5 and later uses to take advantage of these features and use Siri voice commands to control it. 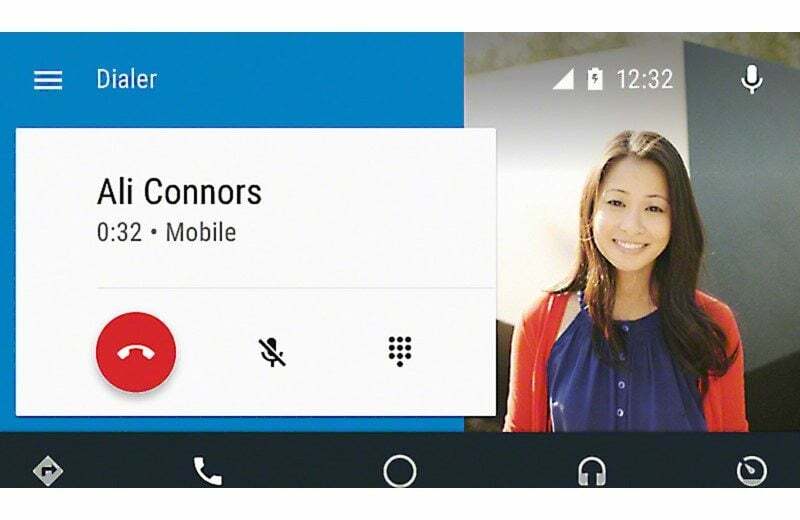 Android Auto is similar and Google Voice controls work similarly for Android phone users. By now I’m sure you’re familiar with Bluetooth for using a wireless connection for music playback. 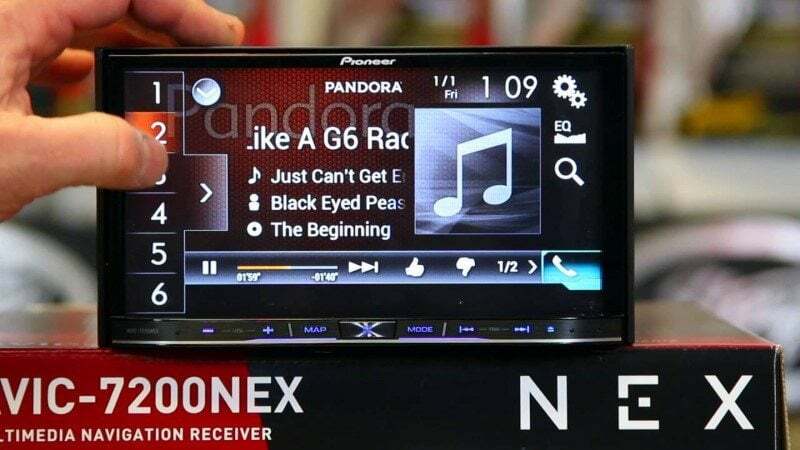 However, additionally some models offer direct control of the Pandora app on your phone via the Bluetooth connection. In this case you’re able to control your phone’s music selection directly on the touchscreen rather than having to pick up your phone. It’s a convenient feature if you’re Pandora music fan. 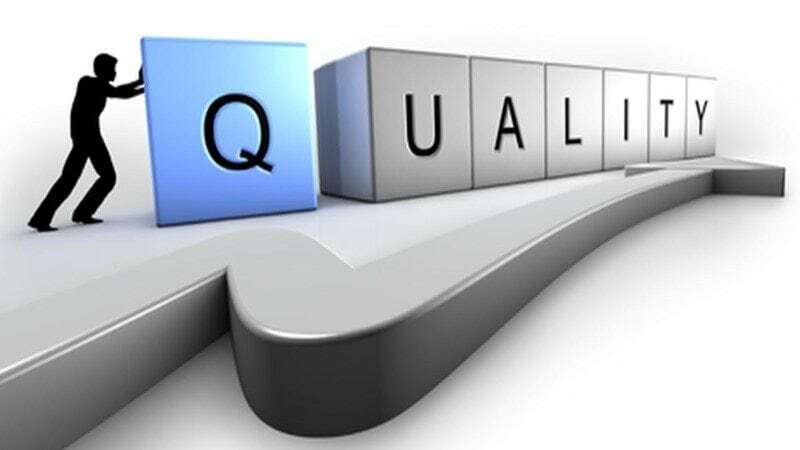 For getting the best sound, ideally buy a good quality brand as they tend to be better designed in terms of sound quality. Lower-end touchscreen stereos often have a poor signal-to-noise ratio and lower signal level out RCA outputs. This is especially important if you’re building a system with amplifiers and better speakers. What you might not be aware of is that in-dash car stereos that are capable of video playback have preventative features. For example, many require the parking brake signal to be wired to an input on the radio’s wiring harness. In this case it means typically you’ll have to activate the parking brake in a pattern before the stereo will allow videos to work. This is a built-in safety feature and protects the manufacturer from liability due to drivers being distracted while driving. But what if you want to bypass this? In this case you’ll need a video bypass module like this one for Pioneer touchscreen radios. A bypass module will fool the radio into thinking the vehicle is stopped and you’ve carried out the safety override. That way you can bypass safety warning screens as well as play videos as you like. One major issue with buying cheaper touchscreen stereos is their higher rate of defects, poor reliability, and even software problems. Lower-end brands are often generic and sell an identical or similarly styled product under different brand names called “rebadging”. Cheaper brands don’t have the same investment in quality control and check software bugs as more reputable brands do. I’ve noticed over the years how cheaper touchscreen radios may seem appealing at first, but they have fairly high defect and malfunction rates. It’s reflected in the buyer reviews you’ll see when shopping. Sometimes their software is buggy and also slow. Those are the kinds of unexpected problems you won’t know about until it’s too late, and you realize you’ve made an expensive mistake! Better brands rarely have these same issues. Because of this I strongly advise you to stay away from the cheapest models. Considering how much you can get for just a little above $200 these days, there’s really no reason to make that mistake. Fantastic sound and picture quality. Alpine advanced tech in your dash! Advanced audio controls and great visuals. A value winner! 1. 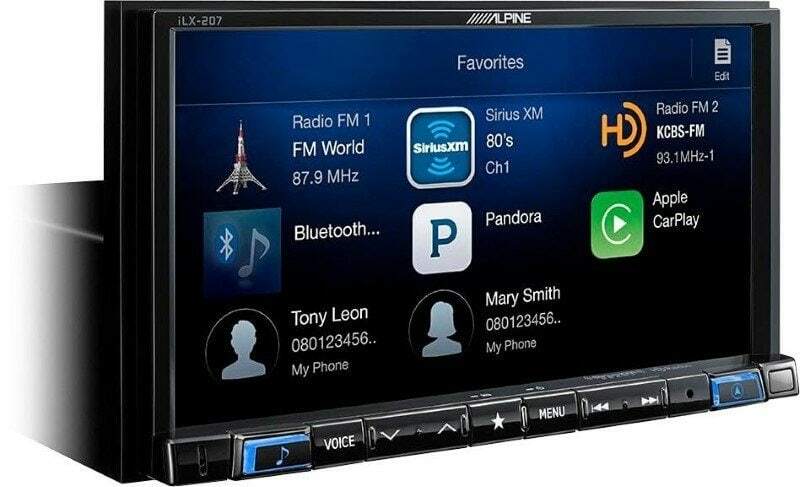 Alpine iLX-207 7″ digital media receiver – One of the most advanced touchscreen radios sold today! The iLX-207 is a digital media receiver (no DVD player) with a unique design. There’s a sharp-looking double DIN 7″ capacitive display on the front and a single DIN chassis on the rear. That gives a big advantage with more installation possibilities where space is a concern. Of course Bluetooth is built-in, but unlike many other products there’s an HD radio tuner built-in as well for great radio clarity. Looking for flash drive convenience? You’re covered there, too! A USB cable makes playing music files from your flash drive a snap. What’s even more awesome is the engine data display capability. By adding the compatible Maestro iDataLink module, your vehicle’s operating data like RPM, speed, fuel, and more and be shown right on the screen. It also allows you to keep factory features like steering wheel controls and more. It’s designed to work with both Apple CarPlay and Android Auto for seamless voice operation if you’re a fan of those platforms. You can also view and access text messages via the front panel. One of the coolest features is the HDMI input which allows you to display your tablet or computer’s video output on screen! Control panel buttons on the screen’s bottom can be changed, too. 18W RMS x 4 internal power is provided for driving speakers directly. However, for the best sound quality possible, use the 4V RCA outputs with provide front, read, and subwoofer outputs. GPS navigation is provided, as well, using the magnetic GPS antenna provided. Take and make calls via the Bluetooth connection, as a microphone is included as well. Want to add a backup camera? No problem – there’s an input for that as well. One amazing feature is the ability to control external outputs like relays to activate a winch, lights, and much more (you’ll need the KAC-001 External Accessory Controller, sold separately). Without a doubt, this is one of the most advanced touchscreen radios sold today. It’s a great choice for anyone who uses digital media on a USB drive or via Bluetooth apps like Pandora. Head over here to check out the current price and great reviews at Amazon. 2. 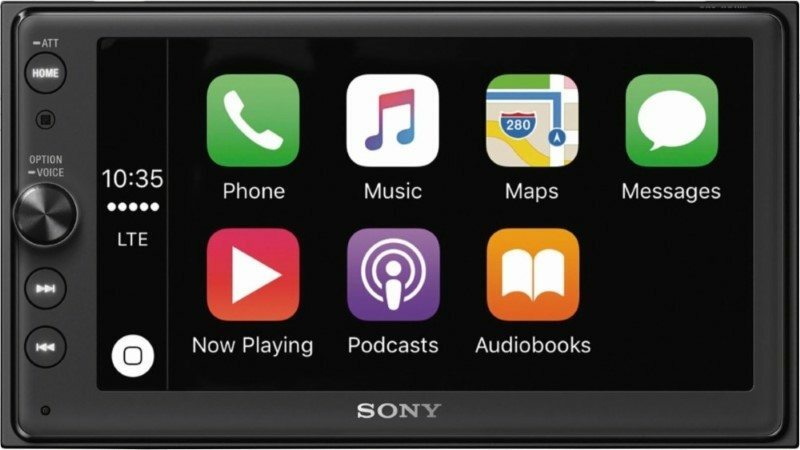 Sony XAV-AX100 6.4″ CarPlay/Android Auto media receiver – Great sound and interface…you’ll love it! The Sony XAV-AX100 brings you into advanced audio and features with a great interface and clean, sleek design. It’s design makes Android or Apple smart phone control intuitive and user-friendly. Unlike many others today, it features a rotary volume control so there’s no fumbling with buttons or screen controls. As it supports both Android Auto and Apple CarPlay, hands-free operation is easy. 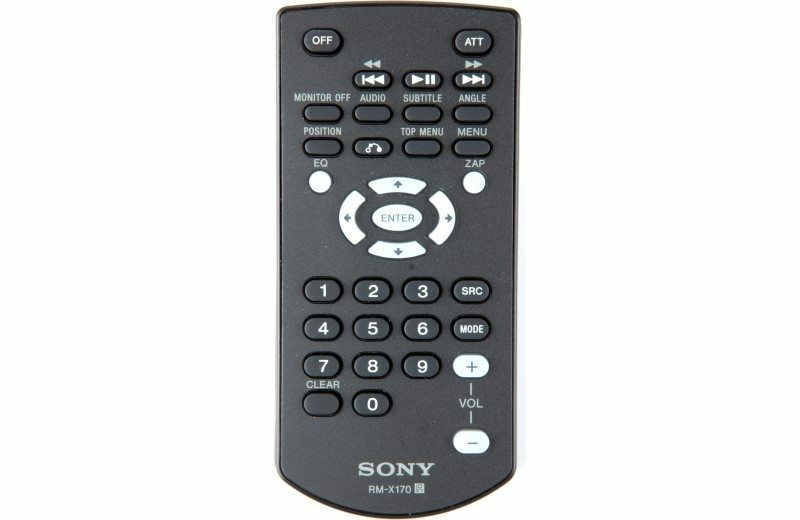 The Sony makes taking calls and viewing text messages super easy! The display is excellent and very straightforward. Bluetooth support allows you to use your favorite apps for streaming music or hands-free calling using the included mic. Pandora control also means you don’t have to touch your phone to channel music sources or tracks. Don’t worry, though – with all these great features you’re not giving up great sound quality! The XAV-AX100 also includes high and low-pass filters as well as a powerful 10-band equalizer to tailor the sound to your system. 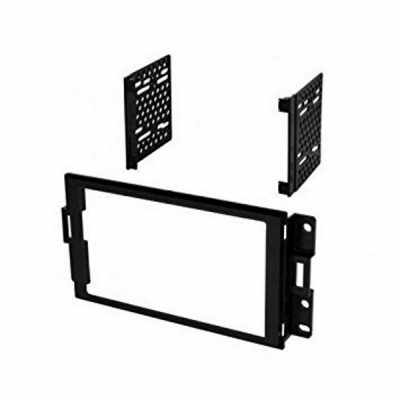 The unique design uses a full double DIN front section with a smaller single DIN section on the rear, making installation easier. Got limited space? You won’t have to stress over hiding cables like with larger units. Running external amplifiers? 5 RCA outputs are provided for front, rear, and subwoofer use. You’ve also got 20W RMS x 4 channels of power to drive speakers with. Using the high or low pass filters you can get excellent, low-distortion sound and great clarity. Need extra punch on demand? Hit the button to engage the ExtraBass for advanced sound boosting with low distortion. Music fans with a USB flash drive can use the convenient USB jack (cable included) to play files directly from a USB stick. Need a rear camera input? This model has you covered there as well, as there’s a camera input provided. A handy remote control is included too. For those who love streaming music and digital music files on the go, it’s a fantastic choice. (Note: there’s also a version with a DVD player too). If you’re planning to take advantage of AirPlay or Android Auto’s ease of use, it’s a fantastic choice. The sound controls are great, sound quality is excellent, and the user interface is clean and easy to deal with. Don’t hesitate to head over and see the excellent buyer reviews and find out more. 3. Pioneer AVH-X390BS DVD receiver – Affordable quality that’s expandable. Great sound and sharp display! Looking for a touchscreen radio that’s high on value but not short on performance? The AVH-X390BS may just be exactly what you need. The 6.2″ WVGA (800 x 480) display is sharp and clear – it looks great! This model features AppRadio One which gives you the ability to control compatible iPhone and Android smart phone apps to have easy access to your media files right from the touchscreen. You’ll need the CD-IU52 cable for iPhones and CD-MU200 USB cable for Android phones. Hands-free calling via Bluetooth is a snap and so is streaming the music you love! You can display the artist, album, and even use voice recognition over Bluetooth. Making phone calls often? thanks to the Wideband Speech Handsfree Profile 1.6 the signal is similar to FM reception clarity. You can even connect 2 devices at the same time via Bluetooth! Both Pandora and Spotify uses are in for a treat – control your favorite app’s music playback right from the screen. Pandora users can even perform “thumbs up” and “thumbs down”, too. Pandora users get the added bonus of being able to create new stations while using the app. Want good sound control? You’re in luck. 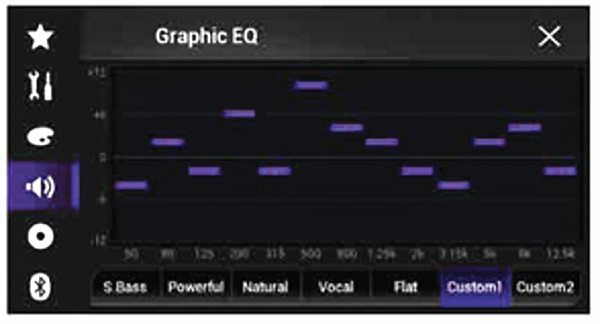 The 13-band equalizer gives you far more control that a lot of the competition. Built-in high and low-pass crossover filters let you build a system with more clarity and lower distortion that you can drive even harder. And independent subwoofer control lets you get bigger bass without being limited by the front or rear output levels. For even more advanced features, you can add the CCD-MC20 for time alignment control and Auto-EQ. It’s truly an advanced head unit for the money. Separate front, rear, and subwoofer outputs provide a great 4V of clean audio signal for building a system. The AVH-X390BS includes a remote, although I think it’s a bit redundant to use it considering how easy the touchscreen is. Still, it’s a nice option to have included for the price. Play back most major file formats whenever you like. The USB interface supports FLAC lossless audio files and even AVI/DivX/MPG4 video files, too. For the price, the AVH-X390BS is truly a great sounding and feature-packed touchscreen radio you’ll love. If you need one that’s affordable, you don’t need AirPlay or Android Auto support, it’s a fantastic choice. I really love the customization features, 13-band equalizer, and the add-on module for time alignment and auto-EQ. It’s a definite winner, but don’t pay too much! I’ve found some excellent reviews and one of the lowest prices over here at Amazon. Note: Need a unit with HD radio support? Check out the AVH-X391BS, its sibling with a HD tuner built-in. 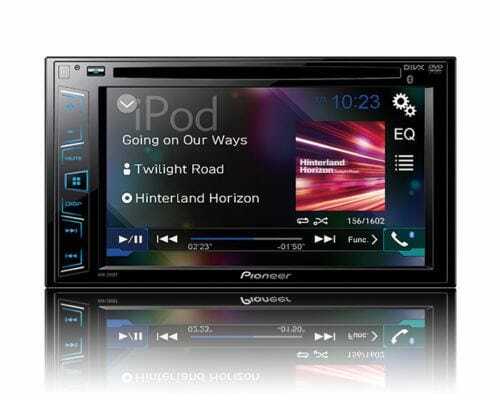 Although it’s a slightly older model, another excellent choice is the Pioneer AVH-290BT. It’s a Bluetooth DVD multi-media touchscreen receiver with a lot of great features for the price. So much so that I wrote a long review here about it here. It’s not just my opinion that matters – check out the may great buyer reviews and the price over at Amazon. All things considered though, if you’re an audio fanatic the many features and expandability of the AVX-X390BS are just to hard to pass up in my opinion. If you don’t already, consider using the Pandora or Spotify apps for streaming – touchscreen control is so much better! 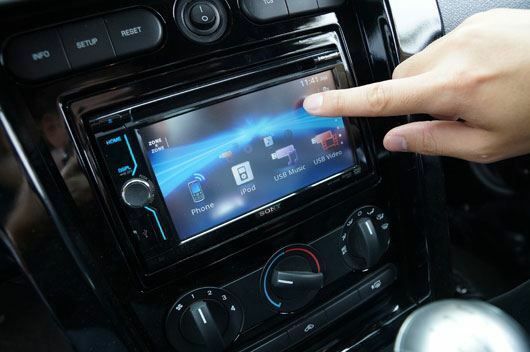 Don’t forget to check your installation needs beforehand – double Din touchscreen radios often are more difficult to install and require custom work. Consider using a professional installer. My review of the Rockford Fosgate P300-12 powered subwoofer. Be sure to contact me via the comments section or the contact page if I can help. 5 of the Best Car Tweeters You Can Afford - And You'll Love! 1. Most often, if an install kit is not available for a particular vehicle and custom brackets need to be made, modification to the face of the dash is also required for proper fitment. 2. A lot of European vehicles have a dash opening that will allow for a double DIN install but the space behind the dash is typically VERY limited. The large chassis of a typical double DIN stereo can make it quite difficult to fit all the wiring and accessories behind the dash. You see this a lot in German vehicles like VW and Audi. The stereos you suggest with the double DIN face and single DIN chassis would make a great option in these cases. Yes I see what you’re saying. Especially when there’s a gap around the edge once an aftermarket double DIN is installed, it’s often a good idea to use a professional installer. It can be really tough if you’re not skilled in improvising when installing. It’s nice to see some options available now with smaller chassis because of exactly what you said (limited space inside the dash).